Design your own dining room, just the way you want, with this Lancaster Table & Seating 22"x30" black 3" bar height column table base! This cross-shaped table base makes it easy to add the compatible table top of your choosing. Round or square, light or dark - the options are endless for creating a sturdy bar height table! Whether you're just opening your first restaurant or are looking to replace the old tables in your bar, we've got the perfect product for you. 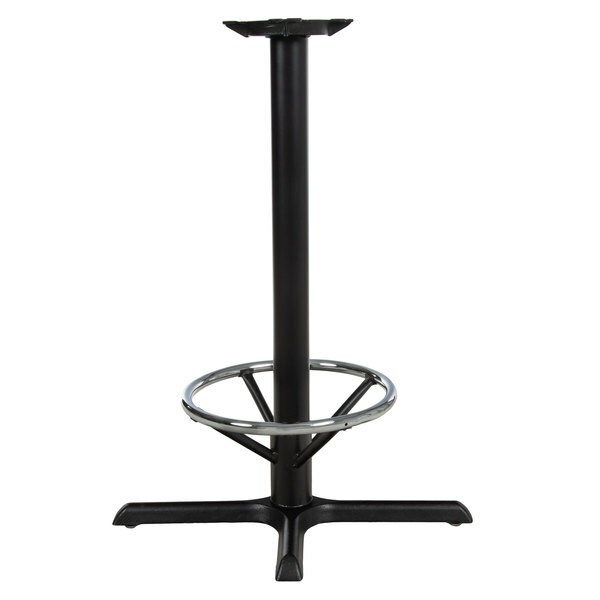 This base's column is made of durable steel to support the heavy weight of table tops and their contents. It measures at 3" in diameter with a threaded interior rod that easily affixes to the spider plate. The spider is made of a heavy cast iron with 8 pre-drilled holes for the included pan head screws to secure the column to the tabletop. This base is able to hold up to a 30" x 48" tabletop by itself, without the support of additional bases. It is finished with an attractive black powder coat for a sleek, professional appearance.